Produce is back in season at the market this week! The warmer temperatures have brought out the asparagus and ripened the strawberries! Bring children for a fun scavenger hunt and egg decorating! Kids and grown ups alike will be happy to enjoy a popsicle from our new vendor Joysicles! Timothy Seaman will be performing at the market from 9:00 am – 11:00 am. 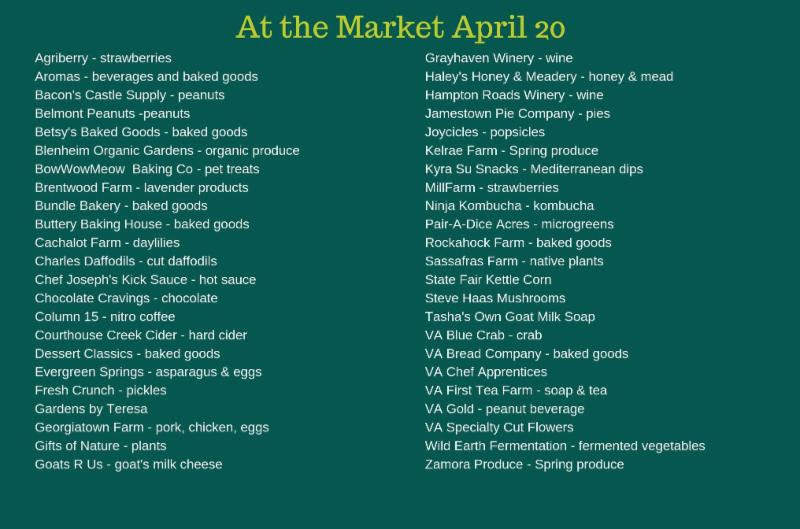 The Market accepts SNAP/EBT, credit cards, and W&M Express. POP Club seeks to incorporate children ages five through twelve into the farmers market community, and empower them to make healthy food choices. POP Club was launched at the Williamsburg Farmers Market in April 2016, and continues to grow thanks to the support of SHIP (School Health Initiative Program). Every Saturday at 9:30, children are invited to listen to a story read by community partners, volunteers, and local celebrities. Then, they can participate in an activity and sample two bites of a fresh fruit or vegetable. Finally, they receive three tokens each to spend on a healthy snack from the market. Wondering what the POP tent has to offer this week? Find out here! Be our Friend The market has a Friends of the Marketprogram. For just a $25 membership, the market will give you a tote bag, and you’ll be added to our exclusive “friends of the market” email list with monthly rewards! Stop by the information tent on Saturday to sign up.